In a sea of new sites that have arrived on the online casino scene since the beginning of 2016, very few have found their way to the top and gained the attention of players, mainly due to the sheer number that have arrived, on top of the veritable plethora that were already there. However, a few names have managed to float to the surface, names like Dunder and Ikibu come swiftly to mind, and Wixstars looks to be on a similar path. There’s none of the bells and whistles and incredible and immersive themes to this site that you will find with the others mentioned, but with consistency, and a clear focus on customer satisfaction, as well as more than a few nice touched that set it apart from the pack, Wixstars is swiftly making a strong reputation for itself. Getting noticed in this outrageously competitive market is far from easy, keeping the attention when you have it is arguably even harder. So now that Wixstars is starting to get something of a buzz around it, what does this casino site have to offer to players to ensure that it will stay on its upward trajectory? Obviously, a site’s content is the most important factor in its popularity with players, but how it looks goes a long way too, because if a site is not aesthetically pleasing to its prospective customers, they may never give it the time of day. That’s why it’s so nice to see that genuine care has clearly been taken over the construction of the Wixstars site, from the cowboy themed logo, complete with Sheriff’s badge design, to the general design of the site that incorporates images from various games available at the site (at the time of writing, the ever-popular Gonzo’s Quest features heavily) everything about the design work at Wixstars shows that care has been taken over it. And that’s before you even get to navigation, which is as simple as it can be here, with thumbnails of popular games, and all games, promotions, and other information easy to locate and comfortably understandable. This is clearly a site that has considered the needs of players, and developed a design, in terms of look and usability, that matches those needs perfectly. It’s almost sad that it’s refreshing to see a site that openly puts players first, but it’s also lovely to find one that does. Once you get past how good this site looks, and, one assumes, decide to find out what it has going for it in terms of content, your attention will move towards the selection of games available. The toughest thing about there being so much competition in the online casino market is finding a site that offers something outside of the usual, and to accomplish that, an online casino must provide games from a range of different developers. With the aforementioned customer focus that Wixstars has, it would be a surprise to find out they didn’t do this, fortunately, they do. Titles here come from Amaya, Core Gaming, Evolution, Microgaming, NetEnt, NextGen Gaming, NeoGames, NYX Gaming, Play'n GO, and Williams Interactive, offering not only a wide range of games and themes, but also a mix of titles that you will know well from other sites, and some that you have perhaps not stumbled across yet. 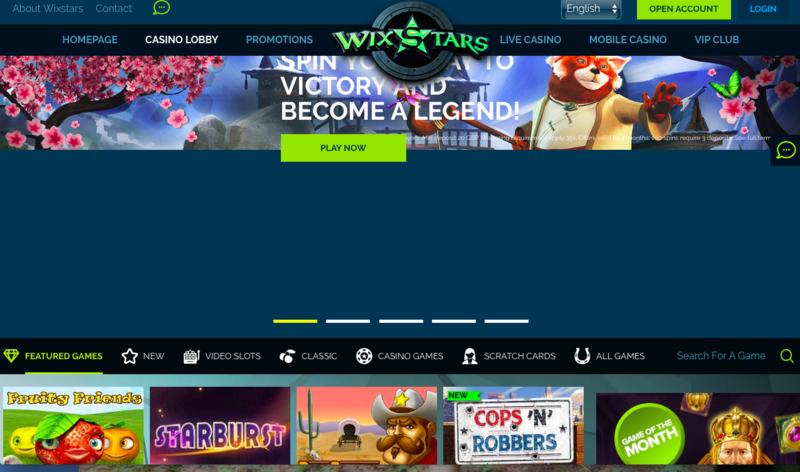 Whereas the successful sites from the last 12 months or so that are listed above brought an entirely new way to look at online casino play, Wixstars went for a simpler, yet equally effective approach. Wixstars takes what everyone else is doing wrong, and does it right, making this a top quality online casino.